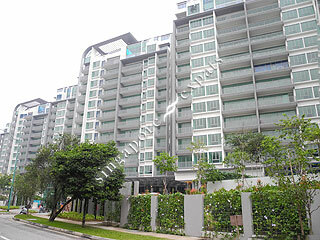 HUNDRED TREES is located at 81 - 95 WEST COAST DRIVE in district 05 (Buona Vista, West Coast) of Singapore. HUNDRED TREES is a 956-year Leasehold Condo development consisting of 396 units. HUNDRED TREES is completed / TOP in 2013 (estimated), developed by GRANDE-TERRE PROPERTIES PTE LTD.
Educational institutions like THE JAPANESE SCHOOL, INTERNATIONAL COMMUNITY SCHOOL, INTEGRATED INTERNATIONAL SCHOOL (IIS), QIFA PRIMARY SCHOOL, CLEMENTI PRIMARY SCHOOL and NAN HUA PRIMARY SCHOOL are near to HUNDRED TREES. HUNDRED TREES is accessible via nearby CLEMENTI, DOVER and JURONG EAST MRT Stations. There are many Japanese schools, good primary shcools and tertiary institutions & university nearby. Great condo with much trees and greens. Lived here for 1 year, but now moving back to home country. Condo is very new! Owner is very very nice! Bedrooms and study have laminate floor, bedrooms with night curtains, very light unit with big living room, nice breeze from the west coast, 2 balconies. Great place with plentiful amenities around the vicinity! Nice development with luxury facilities. Near Aye Rajah Hawker Centre, Nan Hua Primary School. NUS, Ngee An, Japanese International School near by.